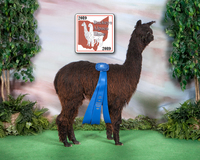 Diamonte of PVA now belongs to AJ's Alpaca Ranch in Navarre, Ohio. We have included him in our database because PVA still owns many of his children and grandchildren. 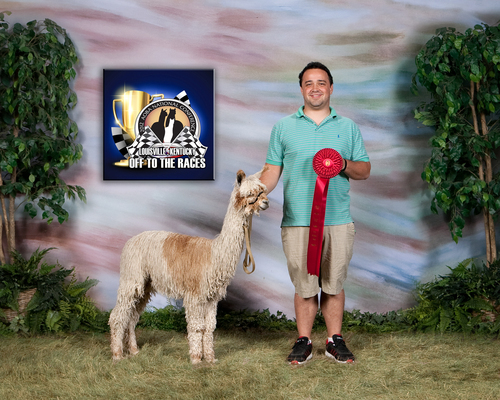 Any inquiries regardin Diamonte of PVA should be directed to Erin Williams-Kerns of AJ's Alpaca Ranch. Neptune is a beautiful young man with great fiber and always has beautiful regrowth. Unfortunately for Neptune, we have his full brother Poseidon of Grace, whom is always used for breeding. Neptune needs to be on a farm where he can also pass on the same impeccable genetics his brother does! His Father, Diamonte of PVA, is one of the greatest and most decorated dark herdsires out there! His mother was a champion and her father Blazen Son is the most decorated white herdsire out there (that was not kept indoors). 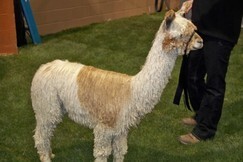 Great bloodlines, great fiber, perfect conformation! Come and check him out! His great grand dam, Clara, came over in the last import with a 14.5 micron fiber and produced nothing but beautiful animals. She carried her fine lustrous fleece up to her passing in 2015 (MFD: 22.4 SD: 4.5 COV: 20.3% FG30: 5.2%). She was amazing! Her genetics live on! Neptune has them!